THE LODGER (1927). After a series of misfires, 1927 was the year that a young English director by the name of Alfred Hitchcock made his name with this suspenseful thriller with horror undertones for the British studio Gainsborough Pictures. It was based on a story by Marie Belloc Lowndes and a play she co-wrote (‘Who Is He?’) inspired by the London hunt for Jack the Ripper. 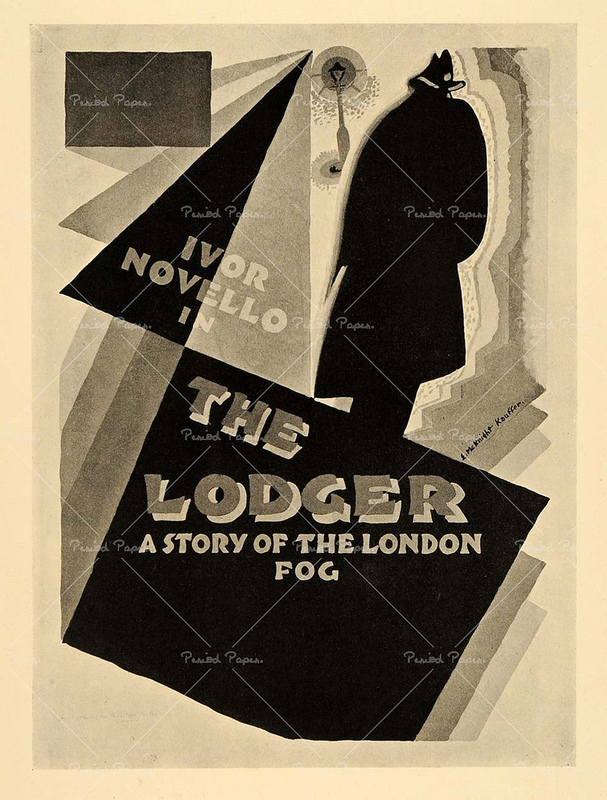 THE LODGER would be an early showcase for Hitchcock themes such as the blonde woman in peril (a favourite female type for him), an innocent man looking to clear his name and novel stylistic touches. The plot centres around a London in the grip of a serial killer who preys on blonde women and has just claimed his seventh victim. All that is known about him from a female witness is that the bottom half of his face is obscured by a scarf and that he leaves a calling-card note at the scene of each crime with the name ‘The Avenger’ within a triangle. Daisy Bunting (June Tripp) is a young blonde model whose parents have a room to let and has a policeman boyfriend, Joe (Malcolm Keen). One night a handsome, enigmatic young man, Jonathan Drew answers the family’s advert. He is scarfed like the killer in the newspaper and bears a haunted, faraway look in his eyes. 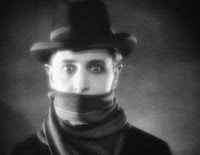 Played by the hugely popular 1920s songwriter/actor Ivor Novello, the casting is crucial in not allowing us to make an obvious guess as to his secret identity. Hitchcock builds the tension well, sowing the seeds of suspicion visually with tricks like a glass ceiling so the parents can look up to see him pace up and down in his room. Drew appears continually mournful and distracted, and he attracts Daisy much to Joe’s annoyance, especially when he is put on the murder case. When Drew goes out late one night, Mrs Bunting hears him leave, goes into his room and finds one of the cupboards. The next morning, another nearby murder victim has been found. As Daisy and Jonathan grow closer, she breaks off her relationship with Joe. The police gradually close their net nearer to the lodging house, the suspense building to fever pitch on Joe demanding Drew’s cupboard be unlocked to reveal a surgeon-style bag containing a gun, a map detailing the homicide sites and a beautiful blonde woman’s photo. Drew gives away nothing except anger and regret. It appears an open and shut case, not helped by Drew escaping out of the front door. Daisy catches up with him, where he breaks down and confesses that the woman in the photo was his sister, the Avenger’s first victim at a dance Drew had attended with her. On his mother’s deathbed, she made him swear to never stop till the killer is caught. Daisy and Drew cover his handcuffs in a local pub, but when the locals become suspicious they pursue the couple, believing him to be the Avenger. Joe discovers whilst in official pursuit himself that they have just apprehended the real killer, so Drew is innocent after all. Horrified, he sets out to stop the growing vigilante mob from killing Drew by mistake, and manages to get to him just in time as he hangs bloodied but alive from a railing. All is well and the couple are reunited safely, her parents happy to be proved wrong about him. Aside from the unsatisfyingly quick resolution in the murder hunt (the true culprit of which is unshown at the director's suggestion) THE LODGER is an entertaining thriller where Hitchcock plays with our preconceptions and circumstantial evidence for the first time. Once Novello was cast, his huge popularity meant the script had to be changed from its original intention to be more ambiguous as to his innocence. I must admit that since this is established with five minutes still to go, I was waiting for an open ending – sadly denied. Hitchcock would go on to mix suspense and horror ingredients even more clearly in PSYCHO in 1960 and FRENZY (1972). The later-famous producer of the film Michael Balcon was reportedly unhappy with the final cut and made Hitchcock make minor changes to some titles and minor surgery on a few scenes. The influence of contemporary German Expressionist directors like Murnau and Fritz Lang can be seen in THE LODGER’s moody lighting and Novello’s performance.